Schellinger sinks to new low in campaigning: misleading literature, Vote Renee Lowerr! I didn't think Tom Schellinger could surprise me anymore with the lengths he would go to win an election, but I was wrong! First, he has his ubiquitous generic Vote Schellinger signs that come out every spring election season, some that still bear the stickers from his run for Assembly rather than Alderman. When he ran for mayor in 2006, he declined taking part in the candidate Q&A forum our neighborhood hosted, but then showed up, while in progress, expecting to be given time to make a speech and avoid any questions! In 2008, when running against Renee' Lowerr (to regain his lost Aldermanic seat) he violated campaign sign rules by planting 5 signs on one lawn across from our polling place. One homeowner in the area said he did not ask permission. That stunt prompted me to write Shame on you, Schellinger: illegally placed signs. But this time, Tom Schellinger has gone too far, in my opinion. He has distributed very misleading campaign fliers, inferring his opponent Renee' Lowerr voted for controversial measures on the council before she even became an alderman! The first side of his flier just says, Vote Schellinger, but then adds, Republican Alderman for District 7. Never mind spring elections are supposed to be non-partisan races. I called our Waukesha County District Attorney Brad Schimel about this and the misleading information included on Schellinger's flier. When I mentioned the candidate was Tom Schellinger, he did say "I am used to hearing his name... he does seem to run for everything." Schimel said it is a violation to knowingly put in false information on campaign literature, but proving it is the problem. He then added, it's kind of unethical to put in party affiliation, but it is not against the rules. These elections are supposed to be non-partisan. Yet Schellinger touts his Republicanism on both sides of his flier. On the back side, he infers Lowerr is not Republican by stating, "Vote for a Republican Alderman..." May I say that I will be; I'll be voting for Renee' Lowerr. While it is true that it is difficult to prove someone is willingly trying to mislead the voters, I would like to at least share some of the facts surrounding the 3 development issues he raises on the back of his flier. Then you, the voter, can decide for yourself. Issue 1 - Fire Station 3: Schellinger states, "Fire Station 3 was moved out of District 7. A move I would have voted against. In an emergency every second counts! I support tornado warning sirens." To me, this infers Renee Lowerr voted for or supported the move, except for the fact she was not elected to the Council until April 1, 2008! The move was voted on Oct. 3, 2007. Alderman Lisa Mellone (she defeated Schellinger in 2006) voted no. Since this was BEFORE Lowerr was elected, our other District 7 Alderman was Mike Franz. He voted FOR the move. It was no wonder I blogged, "Sadly, my other district 7 alderman, Mike Franz, voted yes. Yes, to his own district 7 residents soon to have the longest EMS response times in the city. I sure hope someone is considering running for district 7 alderman next spring. We need another alderman who will represent US and our interests." Renee' Lowerr was at that fire station council meeting and emailed me this report: "The meeting was well attended by mostly Greenfield Heights Residents... I believe that I [Renee Lowerr] was the only resident East of Calhoun that spoke about re-considering their Fire Station move vote & rebuild at current location [on Moorland]." And I am happy to report that Renee Lowerr did step forward the following spring to run for Alderman and won... against Schellinger. Issue 2 - The former Sentry store, now vacant lot on Calhoun and Greenfield: Here Schellinger writes, "Alderperson Renee Lowerr helped derail this development on Calhoun and Greenfield costing the city thousands of dollars in tax revenue and robbing the neighborhood of the convenience of walking to shops, restaurants, and other services. Was it because Renee's back yard is located right along the lot line?" Now, it is true that Renee' Lowerr filed a protest petition against the first Deer Creek Plaza shopping mall plan at that location, not because it was in her back yard, but because it was of that Modified Suburban Overlay design that placed the store in the front of the lot and the parking at the back. This was in 2003, 5 years BEFORE Lowerr ran for Alderman and won. This MSO arrangement was objectionable to the neighbors living along the lot line because it put the public in such close proximity to their private property, unlike the former Sentry with its loading dock at the back. Incidentally, the developer wanted to build it in the traditional design; the city was the one mandating the 2020 Master Plan MSO. Renee got a vast majority of her neighborhood to sign the petition, presented it to the Common Council, and the Council voted to REJECT that plan 11 to 1. Tom Schellinger was one of the votes that voted AGAINST it, thus "derailing" that development. Renee' Lowerr became legendary for she was one of the first people to fight City Hall over unwanted development and win. Please note that this neighborhood built or bought their homes with the Sentry grocery store in their backyards. Again, it wasn't the development that was a problem, it was the configuration of the MSO with public parking so close to their lot lines. Another plan was brought forward, with some expensive options, but the developer couldn't afford to build it for the rent estimates. In June of 2005, the developer came forward with a more modest plan, but the Plan Commission wouldn't approve it. There was something on the Common Council Agenda and approved in Dec. 2007 for the strip mall, this time in the traditional configuration of stores in back/parking in front. From the Council Minutes: "• P.C. #3: JBK Properties, Inc., for approval of new plan and method of operation for construction of two buildings...retail space...at the NE corner of S. Calhoun Road and W. Greenfield Avenue...Deer Creek Plaza." Renee Lowerr was in favor of those other strip malls in her backyard. She was not alderman at the time. If we are pointing fingers, I think the Plan Commission, with their extras, and the 2008 recession are really to blame. I referred to this project in Another planned Brookfield project falls through in 2009. Issue 3 - The Target Store at former Quebecor site on 124th and Bluemound: Schellinger asks, "Would you want this massive Target store in your backyard? As long as it was not in her own backyard, Renee Lowerr thought so! She voted to put it in someone else's backyard." Schellinger's statement here shows how out of touch he is with this neighborhood, because most residents actually are in favor of the project. But even before Lowerr was elected, when the neighbors met at a Plan Commission meeting in 2006, "they were in favor of the property being redeveloped". They did have concerns: #1 restricting development traffic from their neighborhood, #2 keeping the berm on Columbia, #3 preference to condo over apartments and #4 "fear that the retail will remain vacant due to the glut in the retail space already available in Brookfield." Fast forward 6 years to the present, and those concerns have been eliminated or dealt with: #1 development traffic cannot enter directly into the neighborhood, #2 the berm is being kept and in fact, enhanced, #3 there are no more apartments or condos included in the project, and #4 the retail involved here is very popular: Target and Trader Joes. The 3rd largest retailer has something to do with home goods/products, but has not been announced yet. As for the accusation that Target is in these resident's backyards, not so. I drove down Columbia Blvd. to see for myself. (Above photo was taken closer to Bluemound on Columbia. Use tan area, where water main excavation was done, as a reference point.) There are 5 homes facing the street adjoining the project (to the left of the street) So there is the street, then grass, then sidewalk/bike path, a berm with trees (more evergreens are to be planted), then parking lot space, and finally the Target store side! And not one Vote Schellinger sign. Wouldn't you think if these people were so upset with their current aldermen they would be supporting their old one? Don't these statements make it seem that Schellinger opposed development that residents were opposed to when he was an alderman? Well, that certainly is not true if you look at his record. And what about the implication that neither one of our aldermen, Lisa Mellone or Renee Lowerr are representing the residents in our District 7? Here I will take you back to the year 2004. Area residents near Kinsey Park strongly objected to the prospect of the Greenway Corridor bike-path/road--cutting through our small, park and woods. This path literally was in one resident's back yard! Tom Schellinger was our Alderman at the time and also Chairman of the Greenway Corridor. He wanted the trail; residents did not. We organized, and having heard of a woman in the 6th district who fought City Hall and won in 2003 (that was Renee Lowerr), we had some hope of succeeding. After a lot of hard work holding neighborhood meetings, leafleting the neighborhood, writing letters to the editor, contacting all the aldermen and Park & Rec members, circulating petitions, and speaking before the park department and Common Council, we prevailed with a narrow 7 - 6 victory. As with Lowerr and her protest petition, we weren't sure of Schellinger's support the night of the vote. Schellinger very reluctantly sided with our neighborhood. So why all this about Schellinger? Because I value hard work. Renee' Lowerr and Lisa Mellone take their job as Aldermen very seriously. They respond to resident questions and complaints. They work with developers and neighborhoods to make sure zoning is followed and resident concerns are addressed. They represent us. And they work well together. I can't say the same for Tom Schellinger. He can't even be bothered to fill out a candidate info sheet or make sure his signs have the proper office listed on them. The Patch did an article on Aldermanic Election: Challenged by Schellinger, Lowerr Focuses on Development, and he "did not make himself available for an interview"! It seems he is always looking for a short-cut, the easy way out. And that is about how devoted he was to his job as Alderman in the past. In 2008 I wrote this about Renee' Lowerr in my ballot picks post: "Very energetic, hard worker, and I think will be sensitive to neighborhoods regarding development since she had her own NIMBY experience." My opinion hasn't changed. She has my enthusiastic support this time. I hope she has yours as well. Incumbents are not noted on our ballots. Schellinger is first, then Renee Lowerr. How about merit pay for aldermen? "...since Lisa Mellone replaced Tom Schellinger in 2006, we finally have an active voice at City Hall and someone down here who will look into and act on a problem. Lisa devotes a lot of time and effort toward being an alderman." Brookfield Patch: Tom Schellinger I'll save you the trouble. He "Did not respond"
Election day is just a few days away now. Hopefully, you have been following the candidates running in your area, but sometimes, it is difficult to garner the information you need to make an informed decision when voting. Since these are non-partisan races, how do you know who is the more conservative choice? If you live in the southeast corner of Wisconsin, you can take a look at the Wisconsin Conservatives - Vote April 3rd! Voter Guide*. It covers School Board Candidates, County Races, and Municipal Races, where identified Conservatives are running, from Appleton to Kenosha. There is even a spot to leave a comment on each of these web pages. I live in Brookfield. So on this voter guide, my Elmbrook School Board incumbents Wartman and Lambert are named as the conservative choices. I heartily concur. In the County Races section, the only contested Waukesha County Supervisor race for us is for District 7 in northeastern Brookfield (also includes southeast Menomoneee Falls, Butler). The Voter Guide picks Jennifer Grant. She is endorsed by my State Assembly Representative Dale Kooyenga and the Menomonee Falls Taxpayer Association. She would get my vote too, but I live south of her district. Our Municipal Aldermen are not on the guide, but in the 3 contested races, I would pick Dan Sutton in District 1 and Renee Lowerr in my District 7. I know Lowerr to be Conservative. So keep doing your homework and then go vote on Tuesday, April 3, 2012. Polls open at 7am and close at 8pm. It is unlikely Voter ID will be in place, but one part of the law stands: You must sign the Poll List before you vote. *My thanks to Conservative Blogger Randy Melchert for his part in compiling this extensive voters guide! On March 23rd, I attended the Elmbrook School District candidate forum Q&A. It was a great opportunity to compare the views and style of incumbents Meg Wartman (At-large) and Jean Lambert (Area IV) with their opponents Lynn Thomas and Paul Byrne. The following posting is my account of a few highlights from the forum. This is written from my point of view and answers are taken primarily from the notes I took at the meeting. Italicized comments are pretty close to what was said, though not necessarily a direct quote. Comments in parenthesis are my filling in the blanks. If you have cable TV, I encourage you to watch the forum for yourself on Time Warner 13 & 96 at 7am, 5pm and 11pm every day. Usually there are few surprises at these events, but Meg Wartman, first to give her opening remarks, pleasantly surprised me after her opening statement chronicling how she lived in the district 25 years and served on the board 9 years as Treasurer, President, and Vice President. Then she happily reported that in the past, forum questions centered around budget cuts (what to cut--how to meet budget shortfalls), but this year, those (budget cut questions) weren't the topics! I thought, now that is a refreshing change. I wish I could say the pleasant mood continued, but challenger Lynn Thomas spoke next. She began well enough, saying she would bring a new perspective to the board as it shifts from finances to curriculum and that her experience as a private school teacher and mother of 2 young children would help. Then Thomas made everyone sit up and take notice when she switched her campaign mode voice to what I can only call very emphatic, controlled anger--a slow boil--as she said she was deeply disappointed by the tone around her candidacy in regard to some emails circulating and blogs (not mine) bringing politics into this forum. She concluded by slapping her hands (or table, I couldn't see her from where I sat) to emphasize her point. I have never heard any candidate speak that way in a forum before. There was an uncomfortable moment that followed, and I wondered if she realized her performance would be playing on cable broadcast for all the world to see. Jean Lambert put things back on track. She opened with, I have a lot to offer... and she does. Lambert believes they need to work on student achievement and continued fiscal policy--balanced budget, among other issues. Her experience in the private sector as a senior financial analyst for Froedert Health makes Jean a great asset to the board. Paul Bryne, self described Milwaukee native, stated he went to private and public schools. He currently works for a company in Racine and is an Elm Grove resident. He wants Elmbrook to be competitive and stressed transparency at the board level. Question #2: Do you support the state changes in relation to Act 10? All 4 candidates said they did, more or less. Jean Lambert answered 1st: I am supportive of provisions of Act 10. Then she added that what it has done for us is positive. That we came from the point of budgetary struggle, and we are not at that point anymore. It enabled us to sit at the table with the teachers to talk about issues directly, instead of through a 3rd party. I look forward to working together to build a stronger district. Paul Bryne answered that it changed the nature of relationships. The negative being that you have also taken away incentive for a long career in one district, our teachers could be poached. I would add that this is where free market principles come into play, even though it is a taxpayer funded position. Elmbrook can, and often does, offer a better pay scale. Benefits can be used as an incentive. And certainly, most teachers would rather teach in a prestigious district such as Elmbrook rather than in an economically or academically struggling district. Now it was Lynn Thomas' turn. What would she say after her opening remarks? Thomas said, I agree with Paul, ...the former model was unsustainable. But be mindful of the demoralizing effect this had on teachers. She believes they need to develop a strategy to retain teachers. Question #3: Regarding the number of Open Enrollment and Chapter 220 students, increase or decrease? Paul Byrne: I can't say. Open Enrollment & 220 is good for taxpayers because they get credit (on property tax bills) but (it) doesn't help the students. He says, District 1st: Structure the district for people in our district, ...but using excess space is good. We're at a reasonable rate of 8 - 10%. (If we have more room) we should take them. Meg Wartman: In our opening remarks, we all said we moved here because... If we give lots of other options to those not living here, there are costs to that. We haven't taken any 220 for past few years, I would keep it that. Lynn Thomas: I understand the focus on district students, we spent a premium to be here, but we don't want higher class sizes. (She favors) limited non-resident enrollment as place holders, so (we don't need to) close and open schools. Jean Lambert: No 220 and Open (Enrollment). We (are the) primary taxpayer (in our district.) Focus on our students, our residents, not state tax funding. I believe Jean was saying, Elmbrook should keep its focus on its district students. Me: I believe projections indicate there won't be any need for quite some time to open schools! Elmbrook is a donor district. Adding students is not a money maker for our district as it may be in other districts. Question #7: What are your thoughts on 4K, does it have an educational value? Paul Byrne: I am strongly for 4K. Finding child's weak spots early on...4K is a soft-start...its an advantage. It helps us be competitive--future residents will look at this. Me: No, they look at the overall quality of the district. See What? Families who HAVE 4K petition to join Elmbrook WITHOUT 4K? Elmbrook does offer early screening to help residents catch some of those weak spots. Frankly, we haven't seen a dip that others talk of, families continue to (move into the Elmbrook District). Lynn Thomas: I'm strongly supportive of 4K. I did research. Our duty as a district is to offer it. If Elmbrook offered it would be excellent. ....I have reservations for the cost to taxpayers but it would make our community more competitive. Then Jean added an important factor: I don't think we need to take this (4K) away from private schools (private sector jobs) and put it on the taxpayer dime. She concluded citing the incident when Waukesha petitioners, with 4K, filed to join Elmbrook School District with no 4K. The 2nd Question from the Audience: Do you think the district should stick with its plan to close Tonawanda? Now the answers to this question rather took the wind out of the Save Tonawanda crowd and candidates Thomas and Byrne. Meg Wartman: There isn't a plan to close Tonawanda! Lynn Thomas: I know there isn't a plan but I think it is a definite (one for future?) There has been talk of it in past and would cause over-crowding. I would not support...its the only school in the heart of Elm Grove. Jean Lambert: I agree with Meg, there isn't a plan to close Tonawanda. As we look ahead in our financial plan, our future looks bright. Paul Byrne: I'm for neighborhood schools...I wouldn't want to see that happen. I'd like to see us more aggressive in getting kids into our schools. After a few more questions, they concluded with closing remarks. I am citing only Wartman and Lambert here. Jean Lambert: As a 40 year resident, I bring a demonstrated commitment to this district. I have 30 years private sector experience and 3 years on the board. I would be honored to serve. After the forum, I briefly spoke with board member Glen Allgaier. It was obvious he admires Jean Lambert and Meg Wartman and then mentioned how well this board works with each other. They have the ability discuss things, even though they don't always agree, in a productive manner. I would like to see that relationship continue. I think Jean Lambert summed it up well in Elmbrook incumbents face challengers: "'I'm running because we have, for the past couple of years, done a lot of heavy lifting with regards to Act 10 and decisions about Open Enrollment and the closing of Hillside,' Lambert said. 'Now we can concentrate on student achievement, acclimating the new superintendent and building our school communities as we have needed to redistrict.'" Meg Wartman is one of that collective "we" Jean spoke of in the above quote. They have done heavy lifting. They have made tough decisions and our Elmbrook School District and the Elmbrook taxpayers are the better for it. We should reelect Meg Wartman and Jean Lambert to serve on the board another term. Remember that everyone in the Elmbrook School District votes for both school board races, regardless of where you live in the district. We should be used to it by now: It's spring election time and Brookfield's perennial candidate, Tom Schellinger's, generic campaign signs are popping up on the main drags in southeast Brookfield--District 7. This go around, Tom is running for 2 offices at once! Which ones? After all, you can't tell by just looking at his signs, for they just simply state, Vote Schellinger. He is running for Waukesha County Supervisor and trying again to regain his Brookfield District 7 Aldermanic seat. Holding both offices is not against the rules; it is allowed. But I did question that arrangement causing a conflict of interest for an Alderman/Supervisor when representing their constituents. In a recent conversation with Waukesha D.A. Brad Schimel, he mentioned the dual role does present a possible conflict of interest, as Kathleen Cummings is finding out. In fact, when I met Waukesha County Supervisor and Waukesha Alderman Kathleen Cummings at the Folk Fair last fall, I did wonder how that arrangement would work, should City issues conflict with County. (We were seated across from each other at the common seating in the food area and started chatting. She mentioned she was both a Supervisor and Alderman.) As I sat there listening, I wondered which group one would side with if the interest of the City differed from that of the County? Though she thought it was a great opportunity at the time, she is now in a difficult spot because the City of Waukesha Police Chief is opposed to joining in with the County's Dispatch Communications Center. Cummings stated last month she "had been against joint dispatch but is willing to consider because of the county's new software..." This month she says she "is reviewing the information" though the Waukesha Police Chief still doesn't want the consolidation. I do not bring this up to pick on Ms. Cummings (she seemed nice enough) but rather to illustrate how someone serving 2 masters--the City and the County--could be conflicted as to which group they are representing. I am trying to avoid that happening in my district. Schellinger will be elected on April 3rd as District 20 County Supervisor, because he is running unopposed in that race. And thankfully, the likelihood of him also prevailing in his attempt to win back his job as District 7 Brookfield Alderman, against incumbent Renee Lowerr, is very remote. Still, I don't take anything for granted. If he would prevail, I believe it could create a conflict of interest, because his newly outlined Waukesha County District 20 area includes all of Brookfield District 7. As I mentioned in the title, Schellinger is using some old Schellinger for Assembly signs in this campaign. Now that was one effort I didn't remember. I do remember most of his other attempts though. However, his race for 2 offices this go round can't top his 3 at once try in 2006: Waukesha County Supervisor, Brookfield Alderman, and Mayor of Brookfield. But 6 years ago, at least he was opposed in each race. Even back then, Journal Sentinel columnist Laurel Walker poked fun at his efforts in a piece titled, If at first you don't succeed, run again from Dec. 3, 2005. Laurel opened that column, "In one of my columns last week, I tried to encouraged civic-minded individuals to think about running for public office in local government... ...But I wasn't exactly advocating that anyone take on two at once. And certainly not three." Then she added, "It's not like he needs practice. Schellinger is fast becoming Waukesha County's own Harold Stassen." As for this election cycle, isn't holding one office enough, Tom? I sure hope so. I received a robo-call last night inviting me to the Wisconsin Faith & Freedom Presidential Kick-Off at the Country Springs Hotel in Waukesha this Saturday, March 31, 2012, from 10am to Noon. The event is free, but you must register in advance on their webpage. Though the primary process pretty much a foregone conclusion, this is still a unique opportunity to see these 3 candidates together. They are expecting "... over 1,000 grassroots activists, pastors, and key leaders from across Wisconsin to attend the WI Presidential Kick-Off, including the 2012 GOP Presidential candidates, which will be one of the premier events leading up to the GOP Presidential Primaries." Entropy and the Origin of Life is the subject of Tuesday's Creation Science Society of Milwaukee meeting at 7:30pm at Wisconsin Lutheran High School Auditorium*. At this meeting, Dr. Bruce Holman will explore just how entropy enters into the discussion of the origins of life. "In this presentation the concepts of entropy and the second law of thermodynamics will be described, and used to show that the availability of more time and space actually makes a spontaneous generation of life less likely." To refresh your memory, because entropy and laws of thermodynamics aren't exactly household words, entropy is the subject of the 2nd Law of Thermodynamics. The 1st Law states "that matter/energy cannot be created nor destroyed " and the 2nd Law says "the quality of matter/energy deteriorates gradually over time." Neither of these Laws support the theory of evolution. Who is Dr. Bruce Holman? He "received his PhD. from Northwestern University in Organic Chemistry, and has pursued an active research career on a wide range of physical and organic chemical problems resulting in several publications in peer reviewed journals and 3 granted patents. He was asked to establish the chemistry department at Wisconsin Lutheran College in 1985 and taught all undergraduate chemistry courses as well as many math and physics courses during his 8 years as professor at WLC." Dr. Holman also taught Organic and Biochemistry at Carroll University and Concordia University and recently conducted research as an associate at Marquette University in Nuclear Magnetic Resonance technology. Currently, he is executive director of the Lutheran Science Institute. I am looking forward to hearing his presentation on Tuesday. Wisconsin Lutheran High School is located at 330 N. Glenview Avenue in Milwaukee, which is just south of the intersection of Glenview Ave (84th St.) and Bluemound Road, on the east side of the street. If entering from the parking lot, use the south-east entrance; if you park on the street, use the front entrance to the High School. The meeting begins at 7:30pm in the auditorium. *Location has been changed from the cafeteria to the auditorium. Next month, Jerry Frye presents Origins, Beauty, and Wrath: Why What We Believe Matters Today on Tuesday, April 24th 2012 at 7:15pm at Brookside Baptist Church in Brookfield. There are 2 important meetings in Brookfield this week, unfortunately, both are on the same day: Thursday, March 22nd at 7pm. This is a great opportunity to learn about the 4 candidates running for the 2 board positions on the ballot. Incumbents Jean Lambert and Meg Wartman will face opponents Paul Byrne and Lynne Thomas, respectively, on April 3rd. Though I am a supporter of both Jean Lambert and Meg Wartman, I do plan on attending the Candidate Forum to get a better sense of each candidate's position on important issues such as 4K, school closings, and open enrollment. Remember, all voters in the Elmbrook School District vote for both the At-Large and Area IV seat candidates, regardless of where you live in the district. Look for a future posting on my findings. This meeting is hosted by District 7 Aldermen Lisa Mellone and Renee' Lowerr. I call these two Aldermen my Dynamic Duo. They really do a great job of informing their constituents here in the southeast corner of Brookfield through info meetings such as this one and by working closely with neighborhoods and developers to ensure a better outcome. Underwood Crossing--Target & Trader Joe's, would be a good example of this process. No doubt, they will give an update on Trader Joes that just made its way through the Plan Commission on Monday. Be aware that both Lisa Mellone and Renee Lowerr are on the April 3rd ballot. This is very unusual but occurred because Lisa Mellone was required to resign from her Aldermanic post in order to apply for the job of City Clerk. She was then appointed to fill the vacancy. So she must run (unopposed) for the remainder of her term. Another possible point of confusion on our ballot is that our area's Waukesha County Supervisor--County District 20, Tom Schellinger, is also running for Brookfield District 7 Alderman against Renee Lowerr! So his name appears 2 times on our Brookfield District 7 ballots. For those of you new to our area, Tom Schellinger was our former Alderman but was defeated in 2006 by Lisa Mellone and defeated again in 2008 by Renee Lowerr. (Schellinger also applied to fill Mellone's vacancy in the fall of 2011 but they selected Mellone.) He is now trying again in 2012 to defeat Lowerr. So this Info Meeting would also be a good opportunity to learn more about Alderman candidate Renee Lowerr as well as District 7 news. More on the Lowerr / Schellinger race later. Senate mining bill on life support, call Senators to save! Sixteen Democrats and one Republican in Wisconsin's State Senate put a stake in the heart of the mining industry in our state on Tuesday, when the Senate version compromise bill was narrowly defeated by 1 vote. If Republican Dale Shultz or even just one Democrat would have voted in favor of this bill, Gogebic Taconite, G-Tac, wouldn't be leaving for more mining friendly, and also iron rich, Minnesota and Michigan. It seemed any hope of streamlining the mining approval process with a mining reform bill was dead, because the Senate session ends on March 15th. But yesterday and today it seems there just might be a glimmer of hope to revive this job-rich bill. DNR Secretary Cathy Stepp spoke on both the Mark Belling Show yesterday and Vicki McKenna's radio program today. She emphasized how the Senate Mining Bill did not circumvent DNR rules as opponents said; it just set a timeline, a shorter deadline, for a mine's approval process. Each specific mine proposal would still have to meet DNR, Army Corps of Engineers, etc. requirements. So what wasn't to like? The failed Senate mining bill added improved wet land creation in its language over present legislation, it was backed by 9 private sector unions, and G-Tac assured 95% of the jobs created would be union jobs. Vicki also emphasized today that iron mining is NOT strip mining, but pit mining. We are familiar with pit mining in almost every area of Wisconsin because it is the same type of mining that rock quarries use. The G-Tac mine pit would be 15 acres in size, about the size of the square block I live on. Once all the iron ore was extracted, it would be restored. In fact, beautiful Lake Wazee, the deepest inland lake in Wisconsin, is a good example of the aftermath of a former taconite quarry or pit mine. If Democrat Senators like Tim Carpenter (608) 266-8535 or Chris Larson (608) 266-7505 will rethink their votes, since their districts could benefit from the increase in jobs at mine equipment builders Caterpillar or Joy Global in Milwaukee, the mining bill and the mining industry in Wisconsin could be saved. If not, we have just secured our place in the race to the bottom for the most unfriendly mine locations in the world. So it is up to the residents of this state to make one last plea to their Senator to change their mind on voting for mining in Wisconsin. Hopefully, they will reconsider. If just one Senator does, the mining bill could make a miraculous recovery and all of Wisconsin will benefit. Find your State Senator here. Be polite; you are making an appeal. (Eagle River, WI) – Few examples illustrate as clearly as the GTac mining debacle why citizens across the state of Wisconsin now claim allegiance to the Tea Party Movement. So many of the problems with which we take profound issue have been on prominent display in recent days—not least, holding industry hostage to excessive taxation and over-burdensome regulations. The shameful and all too predictable outcome in this case has been yet another crippling of entrepreneurial spirit in our state. GTac is a large, proven employer with a good track record, whose executives honorably promised to bring good conservation practices and a great economy to a state starving for jobs. They can now find some other state in which to mine. Northern Wisconsin, however, remains in economic depression, under which it has already suffered for years. Hundreds of people across the state desperately want and need solid, good-paying jobs to help them survive a challenging economy remain. The GTac mine and the expansion it would have brought to related business and industry could have made a substantive difference. Never mind the valuable tax revenues this mining project would have brought to state and local tax bases. As Tea Party organizers in Wisconsin, we have publicly maintained these past three years that opportunity, prosperity, and the individual right to pursue them have been grossly hindered by over-reaching and infringing state and federal governments. We have also consistently noted too great a willingness on the part of our elected officials to pander to special interests against the wise will of the people. We amplify that message today. The mining bill is not the first victim of this marriage between special interests and big government. We can cite many others. The rich, renewable resources available in Wisconsin’s forests, for example, have long been placed beyond the reach of those who could benefit from them. Environmental groups, with the complicity of too many politicians and bureaucrats, have essentially hogtied Wisconsin logging, mills, and additional wood product businesses. One must ask the question: How do environmental groups and the elected officials who pander to them propose that residents of Northern Wisconsin provide a living for themselves? With this mine now yanked out of reach, with the promise of economic success once again cruelly removed, how will people continue to inhabit these regions? Could it be that prosperity and a future for these citizens is not a priority for these special interest groups and their elected friends? We put these questions to our Democratic state senators and their close ally Senator Dale Schultz, whose ―"Republican" alignment with radical environmental and other special interest agendas raises serious questions of its own. influence to control the decisions of our legislators, have in fact assured that the children of northern Wisconsin in particular, now face a future of far less stability, opportunity, and prosperity. We, the undersigned and our respective memberships, will not rest until this trend is reversed. Can Science point to God? 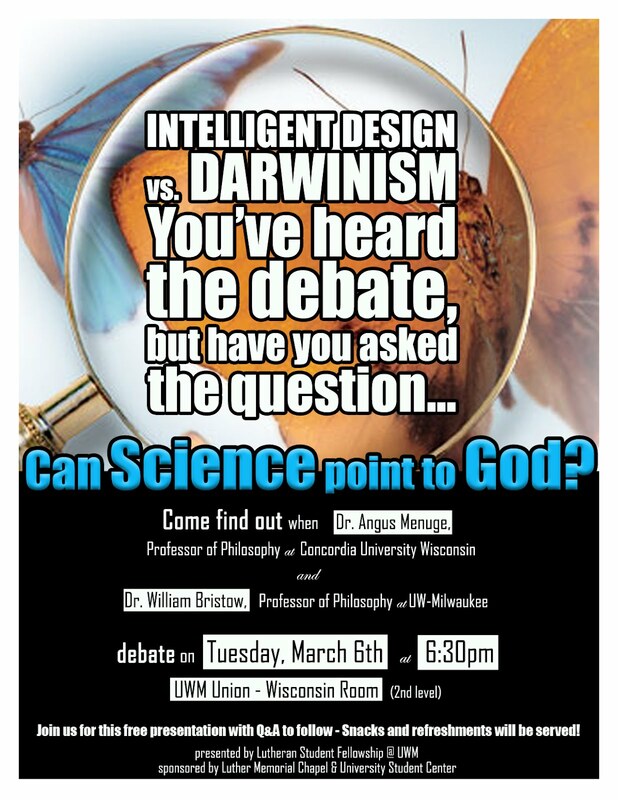 Find out on Tuesday evening, March 6, 2012 when the Lutheran Student Fellowship of UWM hosts a debate between 2 college professors on opposing ends of the origins spectrum: Intelligent Design vs. Darwinism. The debate will take place at 6:30pm at UWM's Student Union (just east of Maryland Ave. on E. Kenwood Blvd.) in the Wisconsin Room -2nd floor. The event is free and will have a Q&A afterwards. Don't miss it! This debate is sponsored by Luther Memorial Chapel & University Student Center in Shorewood. 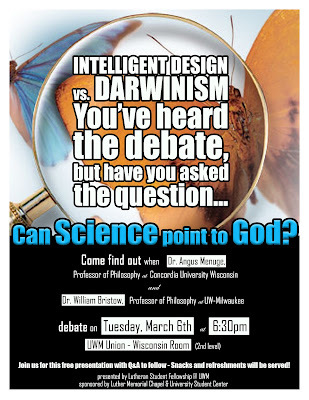 *The Creation Science Society of Milwaukee, the group I am affiliated with, has been trying to line up a debate between one of their speakers such as Dr. Jerry Bergman and an evolutionist for months now. Like other creation groups, we have not been able to find a professor willing to do it.